How do I create a sub-account user role that can manage Rubrics and Outcomes? This lesson will provide the steps necessary to provide a user with adequate permissions to create, edit, and report on outcomes for a given sub-account. For this lesson, we are calling this role "Outcomes Manager" but you can title it whatever you want. In Account Navigation, click the Sub-Account link. In Sub-Account Navigation, click the Permissions link. Click the Account Roles tab  and then click the Add Role button . You can create a New Role Type with limited permissions. Type the name of the new role type in the new role type field . Click the Add button . You will need to make sure the user you wish to become an Outcomes Manager has a user profile in the account. Click the Users link. 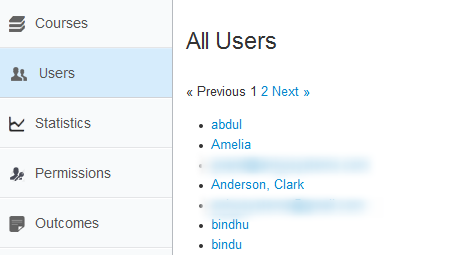 Click the Add Account Admins button within the Admins tab. Select the Add More drop-down menu to set the admin type to Outcomes Manager . Type the email address of the user in the user ID field . Click the Continue... button . The Outcomes Manager will have access to Users, Statistics, Outcomes, Rubrics, and Reporting for the respective Sub-Account.